Love the painting and how I can zoom into the brushstrokes! 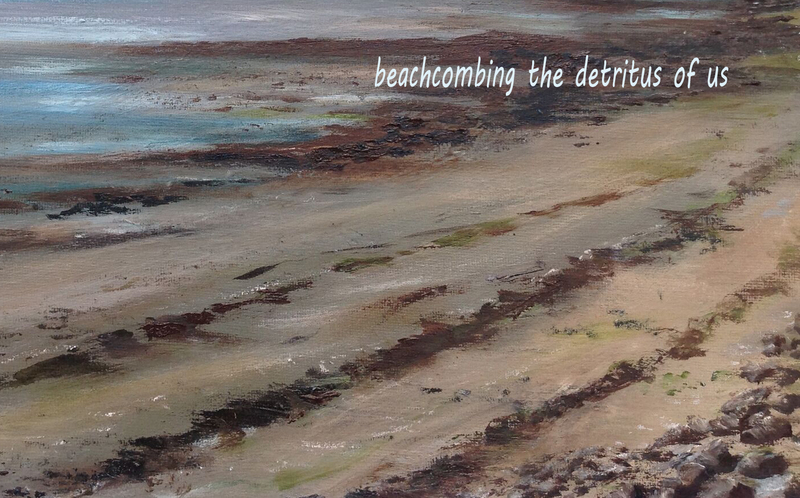 Although 'beach combing' is for 'detritus' this really works, and I can imagine this happening away from an actual beach. I hope it's not the end of a relationship, or is because of your family tragedy? Are you planning to exhibit this at a future date? This is really an ekphrastic haiku I guess, as it was inspired by the artwork. I was obviously in a melancholic mood that day because it isn't based on a particular event, which is unusual for my writing. I love the buildings, both on the right, and in the far distance top centre! I wonder if it is sub-consciously biographical? It's very powerful! So you've seen the full painting, Alan! I was trying to find a digital copy on my laptop but couldn't (although my framer has a scanned copy to make prints, so I'm not panicking :) ) My childhood home on Seaview is among the buildings on the right that you mention and the village of Omeath, across the border up the middle of the lough is in the Republic of Ireland, is in the far distance. I think you are right and this probably is sub-consciously biographical. Sometimes I write things and don't really want to know where they came from, if that makes any sense. Glad your framer has a high resolution digital copy. Yes, I saw the full painting on the internet, and liked that we can imagine about the distant buildings. It's common for good writers to get into some kind of zone where they are not aware they are writing, or what they are writing about. We wake out of the day dream and despite still holding the pen, or keyboard, cannot believe it was us. It's surprising how often it can happen, or a close relative of severe self-doubt, where a writing group can either help/assist or be part of the problem. As my home base is getting more and more up together it's becoming a safe and friendly refuge for anyone either doubting their own work, or wishing to take the next step. Ah, now self doubt is an entirely different beast. That I do suffer from, in both my writing and painting – and it’s usually warranted lol I’m never satisfied, which I think it goes with the territory.